The main problem with patients after trauma or surgery of the craniofacial complex is to maintain or restore all those factors with a stable outcome. The treatment possibilities using classic implants are very often limited due to reduced bone base and limited applications of the conventional system itself. A 28-year-old patient in good general health presented to our clinic and requested treatment in the upper and lower jaw. At the age of six, he was accidentally kicked by a horse, and as a result, the upper jaw fractured into multiple pieces. No treatment was provided at that time, and in the following years, the teeth kept growing, but no functional stimulus was exerted into the bone of the upper jaw on the fractured side. As a result, the teeth could not reach the plane of chewing, and they did not reach the normal spatial orientation within the arch. At the age of 28 years, the patient presented for consultation with a radiologic picture as shown in [Figure 1]. Although he had consulted with an orthodontist before, he was not offered any treatment. After a thorough cleaning of all intraoral soft tissue with antiseptic 5% Betadine® solution, the surgical part of the treatment (including extractions) was performed in local anesthesia (Ultracaine® D-S Forte) [Figure 2]a, [Figure 2]b, and [Figure 3]. 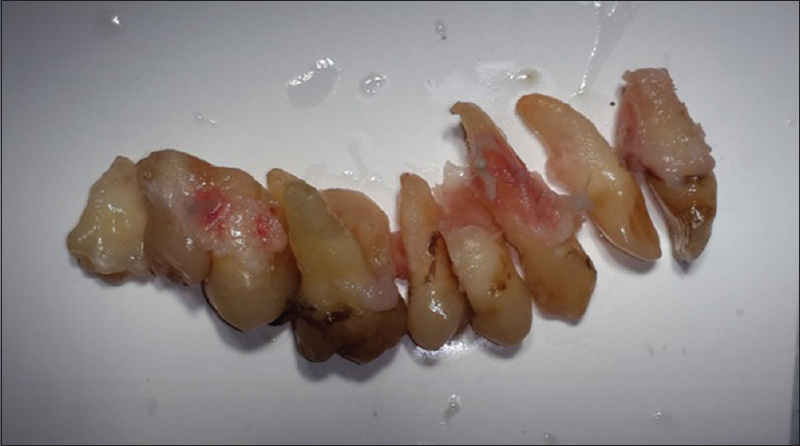 The teeth 11–19 were removed, and after the extractions, the maxillary sinus was wide open from the tuberosity to the area of the removed tooth 12 with a fully ruptured schneiderian membrane. A direct communication between the oral cavity and the maxillary sinus, which was over 4 cm long and approximately 2 cm wide, had occurred. The teeth had been surrounded only by a thin and splintering bone layer, which was automatically removed with the teeth. In addition, multiple small parts of the palatal process of the maxilla splintered off during the extraction procedure and had to be removed. Before suturing, under the direct access to the caudal stump of the zygomatic bone, the implant bed was prepared with the use of a 2.0 mm drill (30 mm long) mounted on a straight handpiece. Immediately after that, a BCS® (5.5 mmd × 20 mml) implant (Ihde Dental, Germany) was placed into the end of the stump using a handgrip with an adapter insertion tool. 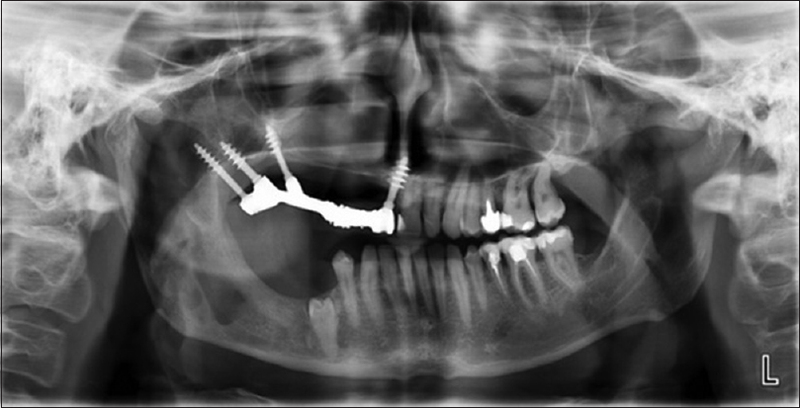 A second implant was positioned into the fusion area between the pterygoid plate of the sphenoid bone and the maxillary tuberosity. The cortical floor of the nose was used for the anchorage of the third (anterior) implant. Due to the second and third cortical anchorage achieved with all three implants, we managed to obtain very high primary stability. The soft tissues were sutured with monofilament Silk 3.0. Even though the full closure of the flap was achieved, the suture line was not supported by bone; and hence, the stability of the suturing was at risk from the very beginning. The impression was taken immediately after finishing the surgical part with a silicone following one step, closed tray technique, using transfers which belong to the BCS® system. The three implants were splinted with a fixed, cemented bar on the day of surgery with the use of Fuji IX® cement as shown in [Figure 4]. 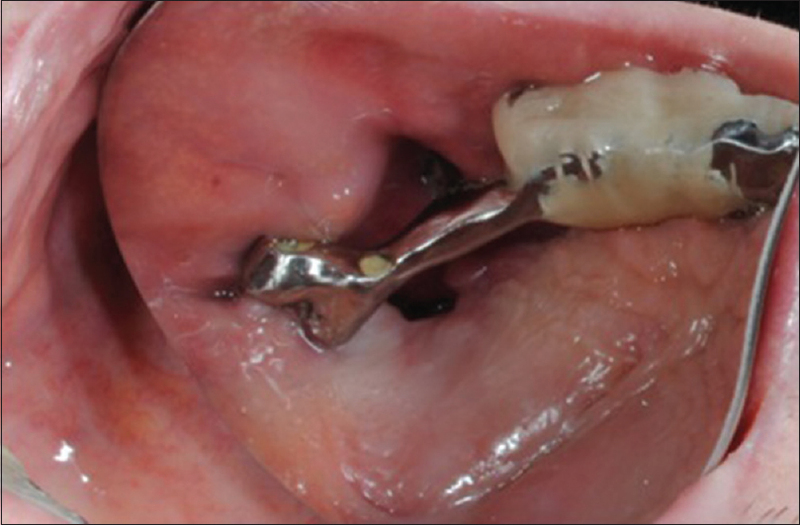 A full, pressure-proof closure of the maxillary sinus toward the oral cavity was not achieved at the beginning. As BCS® implants have a polished surface and are designed, especially for sinus or transsinus placement; there was no danger of inflammation. The patient was requested to take a computed tomography (CT) picture to search for other available bone locations, where more implants could be placed [Figure 5]. The CT revealed that one more tubero-pterygoid implant could be positioned anteriorly to the one which had been placed during the first intervention. This was done 4 months later to allow integration of the first three implants [Figure 6]. According to the findings in the postoperative CT, the implant in area 11 seemed not 100% integrated, so we exchanged it with a wider diameter (BCS = 5.5 mmd) implant. All implants were then loaded following the immediate loading protocol with a new prosthetic construction, that is, a first long-term temporary bridge fabricated from CoCrMo with a composite veneering. The initial treatment phase resulted in an implant borne bridge restoration with masticatory surfaces from tooth 11 to tooth 14, on a fixed, cemented restoration as shown in [Figure 7], [Figure 8], [Figure 9]. Figure 9: An overview on the first fixed, cemented reconstruction. All occlusal contacts are within the supporting polygon marked by two tubero-pterygoid screw implants, one implant in the caudal stump of the zygomatic bone, and one implant in the area of the right upper central with anchorage in the cortical floor of the nose. The treatment plan to follow includes the incorporation of more masticatory surfaces in the upper jaw and replacement of the missing teeth in the lower jaw. At the time point, when this report has been written, the reconstruction in the upper jaw was incorporated uneventfully and stable for ≥2 years, and the oroantral communication remains closed. The conventional approach in this situation would include a multistep surgical protocol with the extraction of all the teeth in the upper jaw, possibly vascularized bone block transplantation and subsequent treatment with endosseous two-stage implants and fixed prosthodontics., Due to the severe lack of natural bone (as a foundation for the bone block), this treatment plan seemed extremely uncertain, in fact, an “onlay bone graft” was not possible, because there was no bone up to the median raphe of the right maxilla. In case of failure, a large communication between the oral cavity and the maxillary sinus would appear, and further treatment would quite probably include the incorporation of a removable, soft-tissue borne obturator prosthesis. The goal of any maxillary reconstruction is to avoid oroantral communication. When weighing up pros and cons of a treatment, we had to take into consideration the patient's quality of life, and it was clear that it would have been better to leave him untreated than provide him with a treatment that would leave an oroantral communication and a soft-tissue obturator prosthesis. Therefore, he was offered a treatment with the Strategic Implant® in an immediate load protocol after extraction of all the teeth in the upper right maxilla, but he was also duly warned of the life-long burdens of an obturator prosthesis in case of failure. 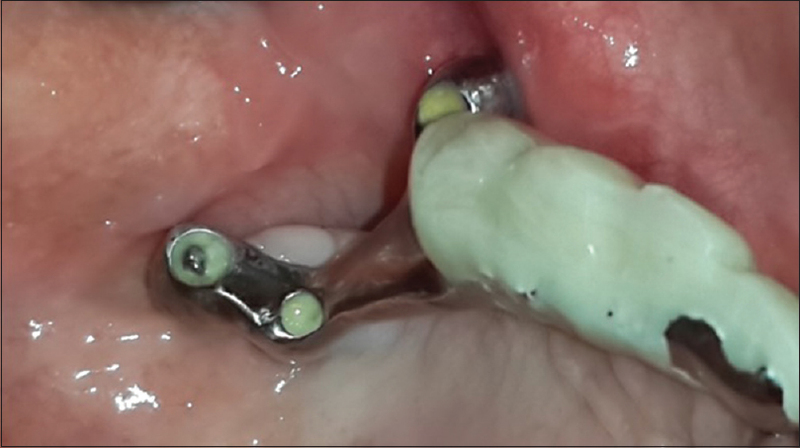 The use of cortically anchored Strategic Implant® allowed for the fixed reconstruction of a severe defect after removing all the teeth in the right maxilla and closing a large oroantral communication. This treatment was sufficient to restore masticatory function to some extent, and it has improved the quality of patient's life regarding both function and the esthetics. Before full restoration of the masticatory function can take place, also more (implant borne) teeth in the lower jaw are required. Wolff J. The Law of Bone Remodelling. Translation by Maquet P, Furlong R. Verlag Von August Hirshwald, Springer Verlag; 1892. Frost HM. Wolff's law and bone's structural adaptations to mechanical usage: An overview for clinicians. Angle Orthod 1994;64:175-88. Hanau RL. Articulation defined, analyzed and formulated. J Am Dent Assoc 1926;13:1694-709. Planas P. Equilibrium and neuro-occlusal rehabilitation. Orthod Fr 1992;63(Pt 2):435-41. Dickerson WG, Chan CA, Carlson J. The human stomatognathic system: A scientific approach to occlusion. Dent Today 2001;20:100-2, 104-7. Maki K, Miller AJ, Okano T, Hatcher D, Yamaguchi T, Kobayashi H, et al. Cortical bone mineral density in asymmetrical mandibles: A three-dimensional quantitative computed tomography study. Eur J Orthod 2001;23:217-32. Šidlauskienė M, Smailienė D, Lopatienė K, Čekanauskas E, Pribuišienė R, Šidlauskas M. Relationships between malocclusion, body posture, and nasopharyngeal pathology in pre-orthodontic children. Med Sci Monit 2015;21:1765-73. Cuccia A, Caradonna C. The relationship between the stomatognathic system and body posture. Clinics (Sao Paulo) 2009;64:61-6. Greenberg A, Prein J. Craniomaxillofacial Reconstructive and Corrective Bone Surgery. New York: Springer-Verlag; 2002. Stewart MG. Head, Face, and Neck Trauma: Comprehensive Management. New York: Thieme; 2005. Barnes L, Eveson JW, Reichart P, Sidransky D. WHO Classification of Tumours Series. Pathology and Genetics of Head and Neck Tumours. Lyon: IARC Press; 2005. Kondo A, Kurose M, Obata K, Yamamoto K, Murayama K, Shirasaki H, et al. A clinical study of maxillary sinus squamous cell carcinoma. Adv Otorhinolaryngol 2016;77:83-7. Zhang L, Ding Q, Liu C, Sun Y, Xie Q, Zhou Y, et al. Survival, function, and complications of oral implants placed in bone flaps in jaw rehabilitation: A systematic review. Int J Prosthodont 2016;29:115-25. Leblebicioglu B, Rawal S, Mariotti A. A review of the functional and esthetic requirements for dental implants. J Am Dent Assoc 2007;138:321-9. Oh WS, Roumanas E, Beumer J 3rd. Maxillofacial restoration after head and neck tumor therapy. Compend Contin Educ Dent 2007;28:70-6. Baj A, Trapella G, Lauritano D, Candotto V, Mancini GE, Giannì AB, et al. An overview on bone reconstruction of atrophic maxilla: Success parameters and critical issues. J Biol Regul Homeost Agents 2016;30:209-15. Aghaloo TL, Moy PK. Which hard tissue augmentation techniques are the most successful in furnishing bony support for implant placement? Int J Oral Maxillofac Implants 2007;22.7:49-70. Singh K, Singh SV, Mishra N, Agrawal KK. 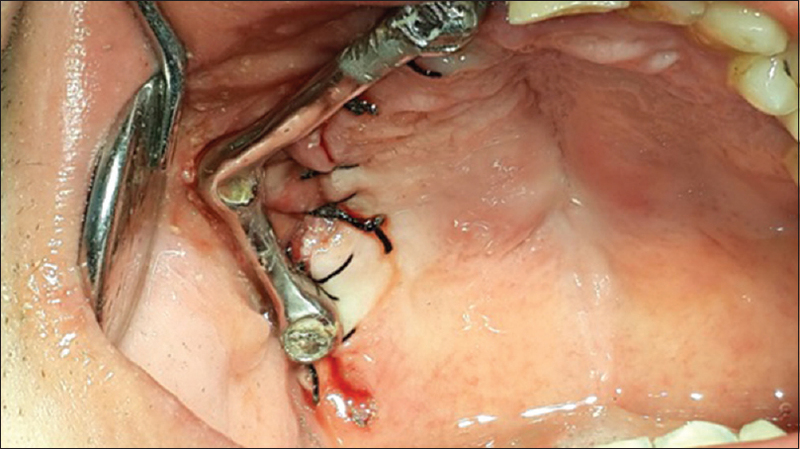 Management of maxillectomy defect with a hybrid hollow bulb obturator. BMJ Case Rep 2013;2013. pii: bcr2012007658. Dholam KP, Bachher GK, Yadav PS, Quazi GA, Pusalkar HA. Assessment of quality of life after implant-retained prosthetically reconstructed maxillae and mandibles postcancer treatments. Implant Dent 2011;20:85-94. Chigurupati R, Aloor N, Salas R, Schmidt BL. Quality of life after maxillectomy and prosthetic obturator rehabilitation. J Oral Maxillofac Surg 2013;71:1471-8. Cha HS, Kim JW, Hwang JH, Ahn KM. Frequency of bone graft in implant surgery. Maxillofac Plast Reconstr Surg 2016;38:19. Ribeiro Filho SA, Francischone CE, de Oliveira JC, Ribeiro LZ, do Prado FZ, Sotto-Maior BS, et al. 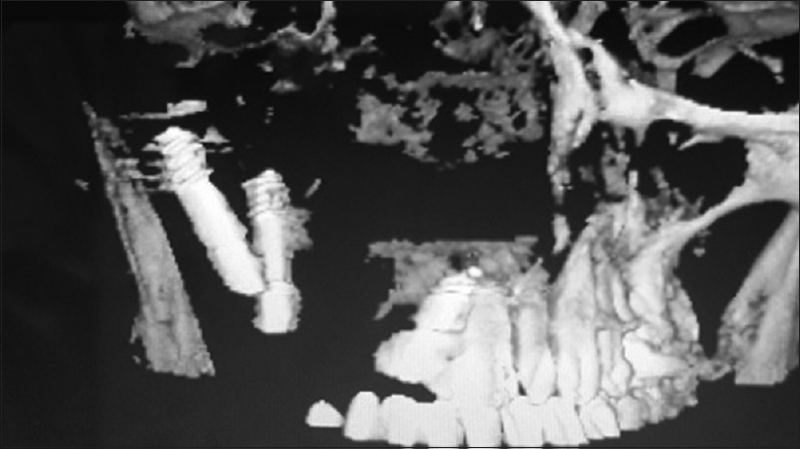 Bone augmentation of the atrophic anterior maxilla for dental implants using rhBMP-2 and titanium mesh: Histological and tomographic analysis. Int J Oral Maxillofac Surg 2015;44:1492-8. Ali A, Fardy MJ, Patton DW. Maxillectomy – To reconstruct or obturate? Results of a UK survey of oral and maxillofacial surgeons. Br J Oral Maxillofac Surg 1995;33:207-10. Okay DJ, Genden E, Buchbinder D, Urken M. Prosthodontic guidelines for surgical reconstruction of the maxilla: A classification system of defects. J Prosthet Dent 2001;86:352-63. Andrades P, Militsakh O, Hanasono MM, Rieger J, Rosenthal EL. Current strategies in reconstruction of maxillectomy defects. Arch Otolaryngol Head Neck Surg 2011;137:806-12. Murphy J, Isaiah A, Wolf JS, Lubek JE. Quality of life factors and survival after total or extended maxillectomy for sinonasal malignancies. J Oral Maxillofac Surg 2015;73:759-63. Kornblith AB, Zlotolow IM, Gooen J, Huryn JM, Lerner T, Strong EW, et al. Quality of life of maxillectomy patients using an obturator prosthesis. Head Neck 1996;18:323-34. Ihde S, Ihde A, Lysenko V, Konstantinovic V, Palka L. New systematic Terminolog of cortical bone areals for osseo-fixated implants in strategic oral implantology. J Anat 2016;1:7.